Dr. Voltzow discusses her intersession research on the effects of increased temperature and carbon dioxide on bleaching of sea anemones. Climate change is affecting marine organisms in two related ways. As the atmosphere warms, the oceans absorb that heat, causing an increase in the temperature of the surface waters. The increase in carbon dioxide in the earth’s atmosphere has also significantly changed ocean chemistry. Carbon dioxide dissolves easily in seawater and enters a series of reactions that until recently keep the pH, or acidity, of the oceans relatively stable. Current conditions, however, have tipped that balance, so that as more and more carbon dioxide becomes dissolved in the ocean, the pH of the ocean has changed toward being more acidic, a process known as “ocean acidification.” These changes in temperature and pH are having a series of effects on marine organisms from the poles to the tropics. Corals and their relatives the sea anemones are facing a multitude of threats, including a phenomenon known as bleaching. These animals house tiny photosynthetic organisms called dinoflagellates within their cells in a symbiotic relationship in which they can absorb the wastes of the coral or anemone and provide basic organic molecules that can be used by the animal. The dinoflagellates have yellowish brown pigment that gives living coral and anemone tissue its color. When corals and anemones are exposed to warming events, they may lose these symbiotic dinoflagellates, causing them to turn white, or bleach. Once an animal bleaches it is difficult for it to recover. Bleaching events are becoming increasingly common; tropical corals are facing a potential mass extinction within the next century. To model the effects of estimated future climate conditions of increased temperature and reduced pH we have been experimenting with sea anemones of the species Exaiptasia pallida. We are able to maintain cultures of anemones in the laboratory and manipulate the temperature and concentration of carbon dioxide in their aquaria. We measure their responses by photographing them with a special light that causes the dinoflagellates to glow orange and by measuring how much photosynthesis they are carrying out. We have found that increased temperature has a greater effect on bleaching than does increased levels of carbon dioxide, but that the combined effect can be complex. 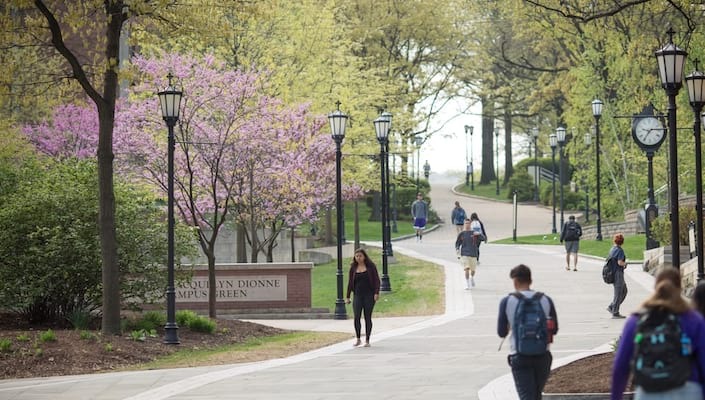 This work is a joint project that was initiated by Laura Romanovich '18. Laura approached me because she was interested in climate change and its effects on coral reefs. Since coral reefs are difficult to find in Scranton, we decided to use sea anemones as models for coral. Laura and I figured out how to carefully control the temperature and carbon dioxide levels in small tanks of anemones and developed the methods to measure their responses. The first set of experiments provided the data for her Honor’s thesis. We are refining this system and, with Robert Rade, Class of 2020, are working to quantify the numbers of dinoflagellates present in the anemones during the bleaching process. 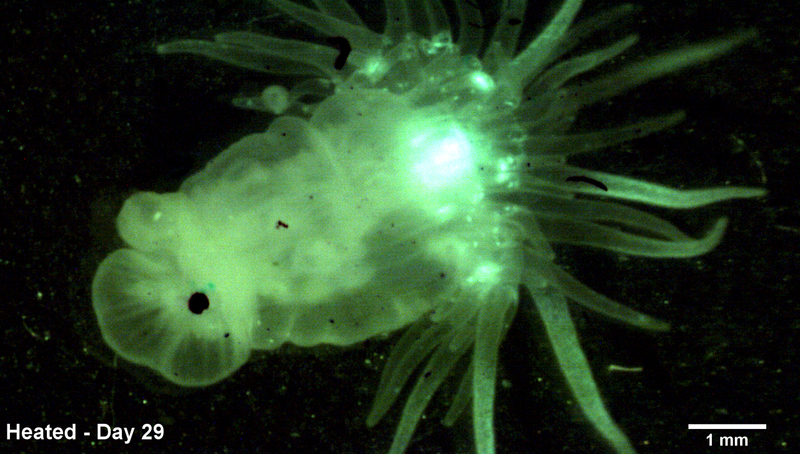 View of an anemone looking down on the central mouth and tentacles, photographed with fluorescent light. Bands with no color are natural regions where there are no dinoflagellates. 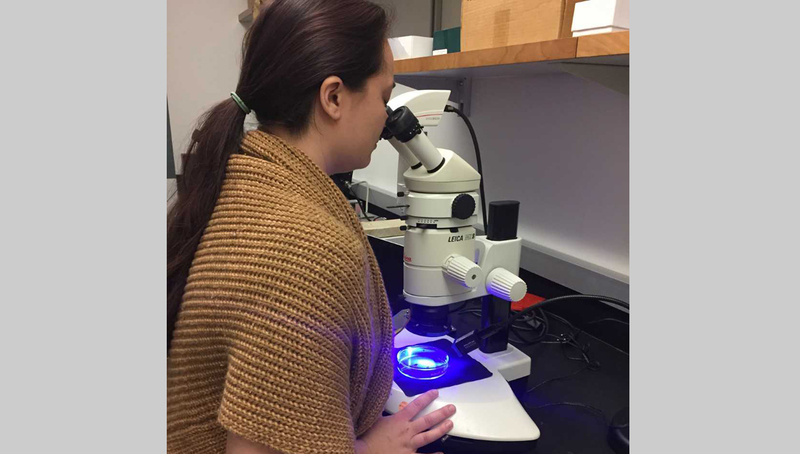 Laura Romanovich '18 photographing sea anemones using a special fluorescent light that makes the dinoflagellates in the anemones glow orange. 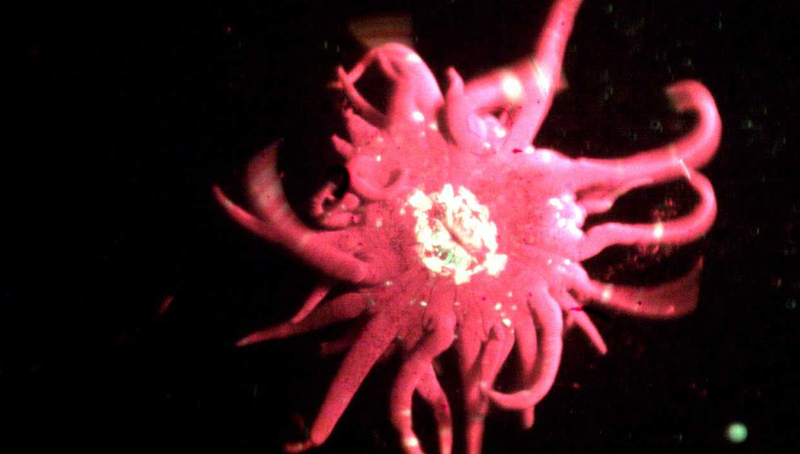 A sea anemone that has bleached as a result of being exposed to elevated temperatures for four weeks. 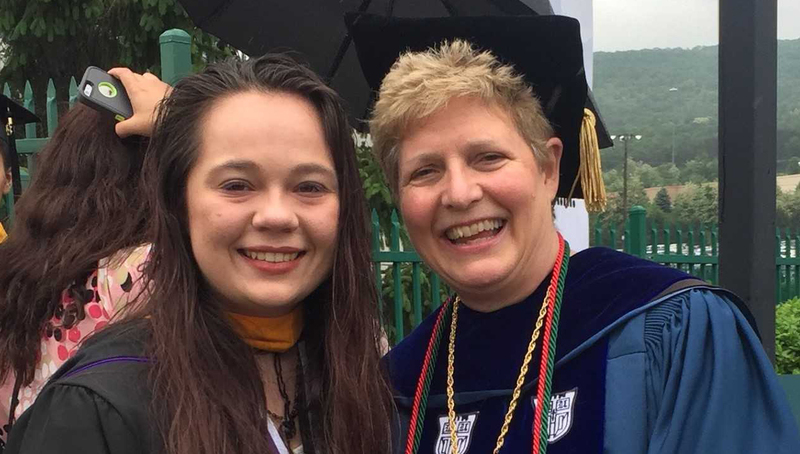 Laura Romanovich '18 (left) and Dr. Janice Voltzow at Laura's graduation last May. Dr. Voltzow is a professor of biology and director of the Royal Scholars Program at the university.